Known for her detailed classroom setup, papers, treasures and trinkets … this Sun Valley, Idaho artist is coming to Sydney to celebrate her Birthday and to share her love for books and boxes. Join us for these unique immersion opportunities. No experience is necessary. These workshops are for everyone. Sharon divides her time between her studios in Sun Valley, Idaho and the San Francisco Bay Area and has shown her work in galleries in both venues. She spent a year living in the south of France, an experience that greatly influenced her work as many found objects from her life there find their way into her work. She recently led a group to the South of France for a week long art retreat. Her work has appeared many times in the mixed media magazine Somerset Studio and she gives workshops at both of her studios. She serves as a Master Educator for Art is You Mixed Media Art Retreats, and will be teaching with Art is You in Australia in the Fall of 2018.. She shows her work at art fairs in both Idaho and California, winning “Best Booth” at the Ketchum Art Festival in Sun Valley, Idaho in 2010, and “Best of Show” at the Mill Valley, CA Arts Festival in 2016. Hornsby is approximately 45-55 minutes from Sydney Domestic Airport. Train Station pick up available. Immersing yourself in this workshop means you can arrive with a coffee cup in one hand, kit fee in the other ready for an evening of adventurous creating. You do not need to bring any tools, glues, paints, or even a pair of scissors!!! This is an immersion workshop! All experience levels are welcome! Fee: $180.00 – includes morning and afternoon tea. 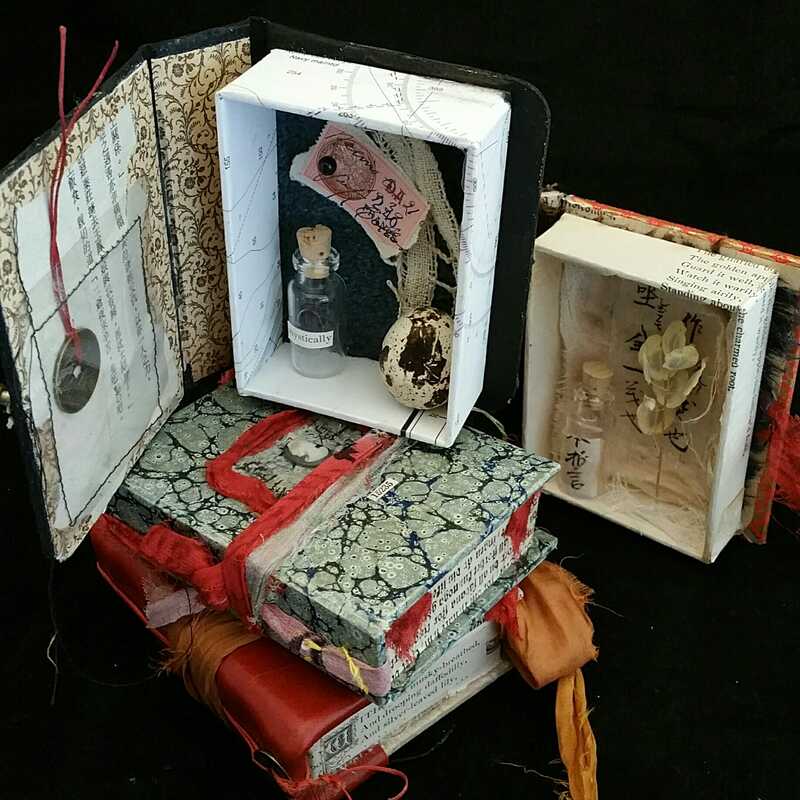 Join Sharon to create your very own Asian Triptych Reliquary book, Your journey will include the use of antique Chinese papers, found in San Francisco’s famous Chinatown. (Found long abandoned down in the basement of one of the stores!) Your creation will have two spines using the Coptic stitch. The result will be just like an object found in a forsaken Chinese tomb. Your workshop will also include access to Sharon’s found objects and papers. 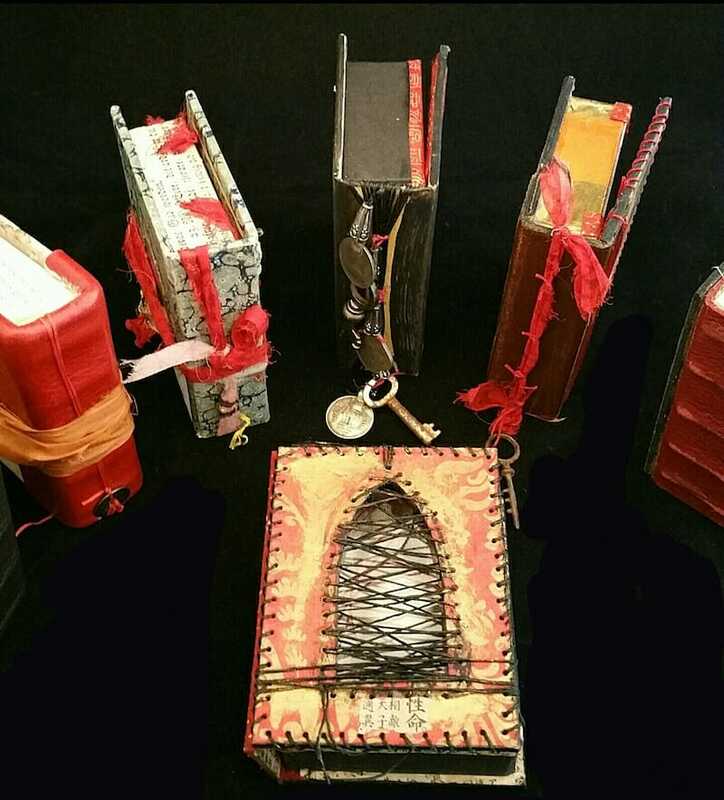 Your Artist book will be made (loosely based) using the stitch designed by book artist Keith Smith and was taught to Sharon by her treasured artist friend, Marsha Shaw. Payment for your workshop can be made by bank transfer or credit card. Please email us to advise of your payment and to secure your spot. We know that situations can sometimes arise causing a change to your plans. It is not possible for us to favor an individual situation or circumstance over another, so we must maintain a standard business policy for all and with no exceptions. After 30 Days: There are no refunds on Classes with International Teachers as we Pre Pay the Teacher…if for some reason you are unable to make the class – you can either resell your seat and let us know who will be taking your spot, or contact us to see if we have a waiting list.